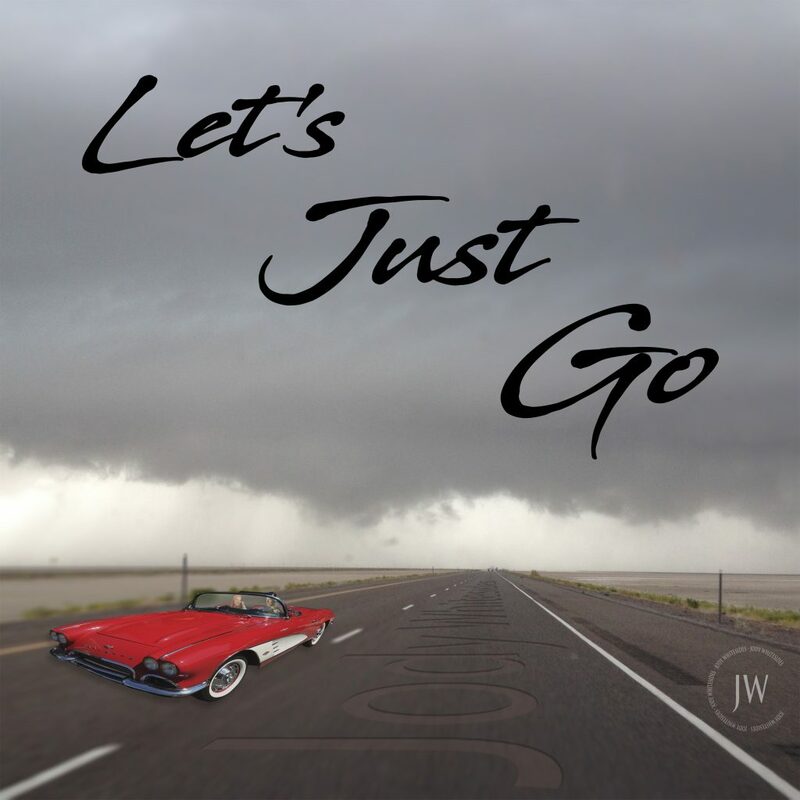 My new single titled Let’s Just Go went live early this morning on all the major streaming and digital services. Think of being in a Tesla launching into ludicrous speed while having Gal Gadot riding shotgun as you go into the wild blue yonder. A whole lot of fun for the blacktop adventure that awaits for the summer. 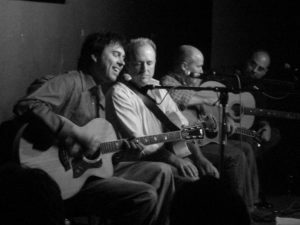 A few years back I got invited to perform at a songwriter’s in the round event. I was placed on stage with some heavyweight songwriters who have written for acts you’ve heard of. Was I intimidated? No. Well… No. I had already met several of them before. But there was one guy who I hadn’t met and he had the biggest cred list of the bunch. Singing “All The Things” at a songwriter’s in the round. 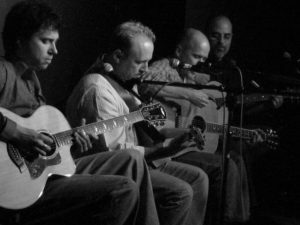 James Grey, Warren Sellars, and Keven Fisher to my left (picture right). Pre show I had asked the two I did know, James Grey and Warren Sellars, if they would play rhythm on one of my songs so I could go and kick into a solo. They agreed. Yippee! Fortunately during the song the guy you see in the background Kevin Fisher also jumped in. After the set I was greeted by Kevin who came up and said “We need to do some writing together.” You have no idea how cool that made me feel in that moment. Kevin is a busy guy. We kept touching base but had a hard time finding time to connect to sit and write. Thanks to technology, we used FaceTime when I finally found an idea and we both had time to flesh out a song. Over the course of a couple of FaceTime sessions we cobbled Let’s Just Go into a full acoustic guitar and vocal tune that we both enjoyed. From there I took on the task of producing it into the sonic vision that would be released with me at the helm. Originally my girlfriend at the time sang the female backing vocals. Unfortunately things didn’t work out as planned, we split up and even more unfortunate – she’s not on speaking terms. Of course I made the mistake of not getting written permission to use her vocal. Mostly due to thinking I’d have permanent permission via marriage. You live and learn, right? That version of the song had Kevin’s publisher thinking we’d be able to get a car commercial. Exciting to envision. Rather than attempting to get someone with no desire to speak with me to agree to sign off on her voice, I opted to hire another vocalist and remove the ex’s voice altogether. Off I went to the local musician’s hang to ask around for quality female singers. This led me to Amy Lynn Whitcomb. There is the possibility you’ve heard of her. Provided you’re a fan of The Voice, or have seen the a cappella group JANE. I listened to the tracks she sent me as examples, in return sent Let’s Just Go over to her to see if she was up for it. Bingo, she loved it. We found a time for her to come over to the studio and replace the previous female vocals. Amy did an awesome job. She took direction and was even able to hit notes that seemed near impossible, you can hear a seriously high octave harmony in the chorus. That’s Amy, not a pitch shifter, I’m impressed. NAILED IT – would be the catch phrase I’d use. I sent the revised version to Kevin and he loved it. With two thumbs up from Amy and Kevin it was time to get it out to you. I’m excited to see the journey this song takes from here on out. Hit me back when you add it to your road trip playlists, I’d love to know.